In large cities there are many shopping places such as the department store, boutique, jewelry shop, fashion buiding, etc. Travelers can select any commodity from traditional to latest style at the reasonable (sometimes expensive) price. In Japan the consumers must pay the consumption tax of 8 %, but do not need to pay the chip each time they eat, take a taxi, etc. Tokyo is the center of plitics and economy in Japan. 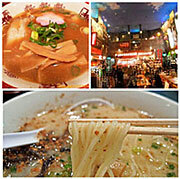 Many travelers do shopping of modern and traditional items and eat every kinds of food in Tokyo. An area crowded with shops that sell various kinds of specialized electronic parts and PC-related parts as well as consumer electronics. In recent years, Akihabara has also been known as the mecca of animation culture attracting people from all over the world and unique maid cafe where fashionable young ladies serve to clients. Famous department stores and high class boutiques are located along both sides of the main Ginza sreet. The center of the Ginza is around the crossing at 4-Block, where various shops representative of the Ginza center on. Department Stores such as Takashomaya, Matsuya, Mitsukoshi have long history and have been directing the commodity arrangement to the high class orientation (including popular one). 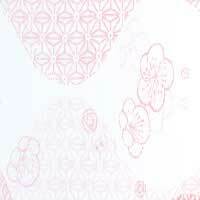 It is situated in the suburbs of Tokyo which has very Japanese style temple and shopping stores. Asakusa is similar to the towns in East Asian countries. You feel very comfortable at the atmosphere. Then we visit Skytree Tower, the highest tower in Asia. 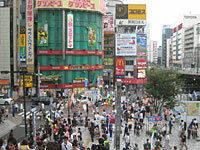 Shinjuku has different atmosphere in the eastern and western side. In the eastern side there are discount camera shops, department stores and many small stores especially for young people. In front of the Shinjuku station there is Yodobashi Camera Shop, one of the largest discount camera shops in Japan. Near the Shinjuku station there are Kinokuniya bookstore which has every kind of books and Isetan Department Store which is representative of Shinjuku and keeps many items of clothing, food and living. In the eastern side there are many skycrapers like wall street. Takashimaya Times Square near the Shinjuku station is a large shopping complex which has restaurants, video game arcades, theaters and so on. Shopping street which is always prosperous with young people. Shibuya is the shopping town radiated from Shibuya station and there are many individualistic shops along the street which has fanciful name like Fire Street, Spain Slope and so on. Parco, Yamaha, Tokyu Plaza, and Seibu Department Store are famous spots. In Harajuku near Shibuya there are many fashion stores and boutiques for young people which sell Japanese traditional items and even modern imported items. 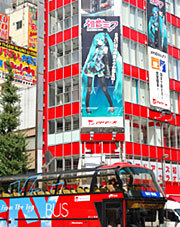 Especially "Takeshita Street" is famous place for sightseeing because there are many kinds of shops and boutiques. But it is always crowded by many young people. Roppongi is visited by many international tourists and has cosmopolitan feeling. There are many exotic shopping stores, boutiques, bars, etc. where people from overseas visit. Even at midnight many people wearing fashionable clothes are walking along the street. Sankeien Garden is one of the highlights of Yokohama, with its many historic buildings that were brought in from various regions in the country, and ancient pagodas. Teahouses and pavillions in the garden are in classic Japanese-style, while the perfectly manicured gardens feature delectable foliage, streams and ponds. Chinatown is located southwest of Yamashita park in Kan'nai area. The area is about 500-700 meters square, and there are more than 500 Chinese food restaurants in the area. It is the largest chinatown in Japan and in the East Asia. 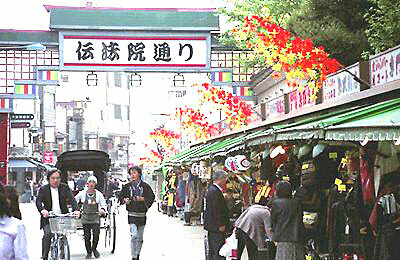 Between Zenrin-mon (gate) and Choyo-mon (the east gate), the main street "Chukagai Odori" runs, and many visitors gather there. This place is the paradise for noodle lovers, but not just because of the (Japanese-only) exhibits of the history of instant ramen noodles. The centerpiece here is the basement, which contains a recreation of 1950s-era Tokyo done in incredible detail, complete with operating branches of 10 famous ramen joints. With old fashoned street foreign people feel very exotic. The first seaside park in Japan. The view of the Minato Mirai area from the park is beautiful, and you can also see the Osanbashi Yokohama International Passenger Terminal. Ohta nawanorenis the oldest sukiyaki restaurant in Japan which was established in 1868. 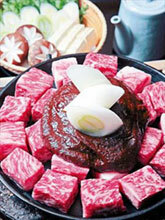 It is a gourmet spot for foreign people since the superb sukiyaki which is cooked of the highest class Wagyu steak and Japanese emotion of enlightenment of civilization are experieinced at the same time. 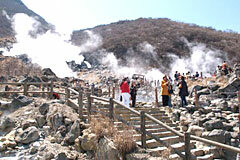 Ashinoko is a lake which was made in Caldera (hollow) in Hakone Volcano about 400,000 yeas ago. The inverted Mt. 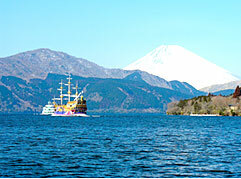 Fuji is seen from Cedar Avenue in the south coast of the lake. Ashinoko has also prospered as fishery area from olden times. Ohwakudani was made by Mt. Kamiyama's (above sea level 1,438m) collapse by the eruption about 3,000 years ago. The trees became decayed, and the rocks got argillated, reddish-brown surface of themountainis being seen. dynamic activity of the volcano such as seething boiler and fumarole blowing up white steam are observed. The most recognizable and fanous mountain in the world, Mt. Fuji is one of the symbols of Japan, 3,776m in altitude. Although it has lain dormant since 1707, it is still classified as an active volcano. Best viewed in winter or early morning when the air is clea.